The Talking Stick Casino is an amazing sight at night time. It is just one of the popular casinos around Phoenix. There are many gambling options in the Phoenix area and in the state of Arizona alone there are 34 casinos. Most of the bigger casinos are located on Native American land and they offer tons of slots options, table games, and poker games. Fifteen of the 34 casinos are hotel casinos and there are over 160 poker tables with every type of game available from Texas Holdem to 7 card stud and Omaha Hi-Lo to Limit Holdem and everything in between. Some of the bigger casinos in Arizona are in Tucson, which is about 115 miles away from Phoenix, but there are also eight casinos in the Phoenix area and five of them are hotel casinos. In the state of Arizona as a whole there are over 18,000 slot machines, nearly 400 table games, and over 160 poker tables. There are also a few simulcast racing venues in Phoenix with both dog and horse races. Many of the hotel casinos have great dining options, live entertainment, and some of the bigger ones even have a golf course. With so many gambling options in the Phoenix area you can be sure you will find what you are looking for in the game you want to play as well as the limit to fit your budget. There are games for low stakes players and high rollers alike. 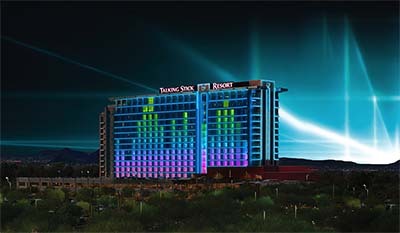 Talking Stick Casino Resort: – The Talking Stick Casino Resort is located in Scottsdale, which is only 12 miles from Phoenix, and they offer 800 slots and video poker games, 50 table games, a keno lounge, and the biggest poker room in Arizona with 47 tables. There is no lack of dining options at the hotel casino and they are a four-star hotel that has lots of live entertainment all year. Harrah’s Ak-Chin Hotel & Casino The Harrah’s Ak-Chin Hotel & Casino is 34 miles from downtown Phoenix and has 1,089 slot machines, 23 table games, and six poker tables. It is in the beautiful Sonoran Desert and they have over 300 rooms available and several nice dining options. They have a bingo room and if blackjack is your game then this is the casino, as 13 of their 23 tables games are solely for that game. Casino Del Sol Resort While the Casino Del Sol Resort is not the closest casino to Phoenix, it is 115 miles away in Tucson, it is the biggest one that has 1,300 slots, 13 poker tables, and 22 table games. The massive $100 million casino was opened in 2011 and they have games for everyone with bets as low as 1 cent and as high as $1,000. There are many dining options available and they are open 24/7. These are some of the larger casinos around the Phoenix area, but there are many more such as the Vee Quiva Hotel & Casino, Desert Diamond Casino, Lone Butte Casino, and Wild Horse Pass Casino to just name a few. The gambling options in the Phoenix area are plentiful and while there are no casinos in the city itself they are just outside and can be reached by car in a matter of minutes. Las Vegas is a four-and-a half hour car ride away and they have a few casinos as well. However, when staying in or around Phoenix you have many gambling options and you can be sure to find exactly what you are looking for. No matter what game you want to play and the limit you want to play it you will find it in the Phoenix area.